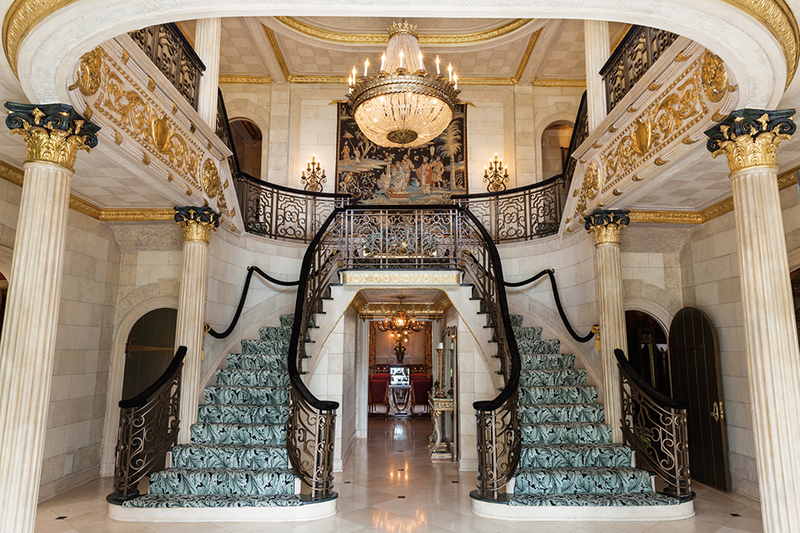 NEW ORLEANS (May 7, 2018) – Antiques and fine art from Gloria Crest, a storied New Jersey mansion that was once home to legendary actress Gloria Swanson, will be offered in a two-day sale at New Orleans Auction Galleries. Built in 1926 by architect J. C. Hameltman of Paterson, N.J., the Italianate mansion is an architectural masterpiece that took years to complete and cost $2.5 million at the time. The stunning exterior includes white-glazed faience blocks and a red terracotta tiled roof, while the grand interior features two wings and an entry with a breathtaking double staircase. Count Stefan de Poniatowski, heir to the Polish throne, and his wife, Edith von Stohn, commissioned Hameltman to design the property. Edith’s father owned the largest silk mill in New Jersey at the time, but the family lost their fortune during the Great Depression. Joseph Kennedy, Sr., purchased the house for his mistress, the actress Gloria Swanson, after the Lincoln National Bank of New Jersey repossessed it. The home and gardens were most recently restored and furnished in 2000. Highlights include a large and impressive allegorical painting by Paul François Quinsac (lot 252); a pair of vintage vitrines commissioned for Cartier (lot 248); a dining room suite that once adorned the Jockey Club of São Paulo, Brazil and purportedly belonged to Walter Chrysler (lot 811); and a two-panel mirrored screen that was once owned by Marlene Dietrich (lot 170). The collection also features an impressive selection of garden furniture, fountains and sculptures, including a pair of monumental cast iron garden urns on pedestals that once belonged to Robert Guccione that stand nearly 13 feet tall (lot 696). The full catalogue is available online at www.neworleansauction.com. Print catalogues are also available for $25 and can be requested by calling 504-566-1849, or emailing info@neworleansauction.com. New Orleans Auction Galleries is open for public exhibition beginning on Monday, May 7 and an evening reception offering cocktails and hors d’oeuvres will be held on Thursday, May 17 from 5-7:30 p.m.